It was an exciting season for basketball, both for boys and girls teams at area independent schools. Swimming, hockey, wrestling and indoor track had their moments, too, treating parents, friends and fans to victories, and tempting colleges with potential recruits. The Haverford School finished their remarkable unbeaten season—24 wins in all—by downing Westtown School in overtime in the finals of the PAISAA (Pennsylvania Independent Schools Athletic Association) championship. 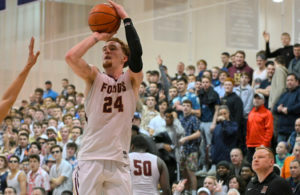 Christian Ray, the Fords’ 6’6” shooting forward and Haverford’s all-time leading scorer, will play for LaSalle College next year. Point guard Jameer Nelson has committed to play for St. Joseph’s University, so the two are likely to faceoff in future games. Meanwhile, Westtown School’s boys team finished second at PAISAA. Its 6’11” center John Bol Ajak is headed to Syracuse University next year. Also graduating is Jalen Gaffney, the team’s point guard. A leading recruit nationwide, he sorted through 14 offers before choosing University of Connecticut. The boys of Sanford School won the championship in Delaware and finished the season 16-4. Led by its juniors, 6’7” Jyare Davis scored 16 points and 6 rebounds per game, while guards Hasan Perkins and Corey Perkins averaged 12 points each. The Villa Maria Hurricanes blew out their competition, with a record of 23-3 overall … and, at press time, they are not finished! Having trounced Elizbethtown, the team is headed for the quarter-finals of states! 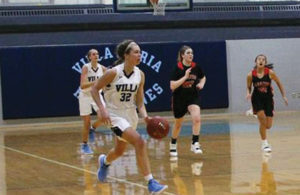 Abby Walheim, 6’0”, who passed 1000 career points in basketball in January and averaged 17 points and 6 rebounds, will play lacrosse for Villanova next year. In Delaware, Sanford’s girls were 10–0 among Independent Schools, 17–4 overall, and ranked 1st in the state. Samantha Pollich, its 6’0” forward, averaged 12 points, 7 rebounds and 5 assists. She’s attracted significant interest from colleges but hasn’t yet committed. Lauren Park-Lane, who scored 9 points per game, signed with Seton Hall. And Olivia Tucker, who averaged 16 points, is going to St. Bonaventure College. The girls’ team at Westtown School had a 17–6 record this year. Jo Lacey, its 6’1” guard, averaged 12 points and 7 rebounds. At forward and 6’0”, Amaya Douglas averaged 12 points and 5 rebounds. Both are juniors. The Shipley School’s girls team was 22–4 and undefeated in the Friends League. Its all-time scoring leader, 6’2” Anna Camden, averaged 15 points and 8 rebounds. Next year, she’ll attend Penn State. Lauren Ross, the team’s guard, who averaged 15 points and 5 rebounds, will attend St. Joseph’s University. Sacred Heart Academy clinched a District 1 Class 2A tournament spot in the PIAA (Pennsylvania Interscholastic Athletic Association) for the third year in a row. Shining at center, Kyra Quigley at 6’0”, averaged a double-double for the season: 12 points and 12 rebounds per game. In a historic first, the Episcopal Academy swim team won the 119th Eastern Interscholastic Swimming and Diving Championship. Ivan Puskovitch broke school records for the 200-yard individual medley and 500-yard freestyle, and has committed to the University of Southern California. Junior Cole Whitsett won the 100-yard freestyle, the 100-yard breaststroke, and 100-yard butterfly, again setting school records in each. He’s going to the University of Tennessee. Brian Brennan, a junior at The Haverford School, swam the 50- and 100-yard freestyle in the Inter-Ac Championship, winning both, then finished 3rd and 2nd at Eastern Championships. He’s headed for the University of Virginia for 2020. Going to Ohio State next year is Malvern Prep’s Matt Magness. He won the National Catholic Swimming & Diving Championship for the 200- and 500-yard freestyle events. In Delaware, Tower Hill’s boys and girls swim teams both won the Delaware Independent School Conference (DISC) championship. Lainey Mullin, an 8th grader, won the 50- and 100-yard freestyle, and contributed to Tower Hill’s first place finishes in the 200- and 400-yard freestyle relays. Freshman Sydney DeBaecke finished first in the 100-yard backstroke. Swimming for the girls at Academy of Notre Dame, Madison Kolessar won the 500-yard freestyle at the Eastern Championships. She’s committed to the University of Florida. Teammate Mia Abruzzo, a sophomore, finished first at Eastern Championships in the 100-yard butterfly and the 200-yard individual medley events. Once again, Malvern Prep dominated the mats in wrestling, finishing 20–4 and placing second in the state among independent schools. Individually, juniors Dalton Harkins and Dayton DelViscio each had 40-plus wins, as did freshman Nick Feldman. Two seniors, Nick Florschutz and Henry Hague, were 36–12 and 26–13, respectively. For the second year straight, Tower Hill won wrestling’s DISC championship, led by senior Ted Hughes and junior Ky Jacobs. Hughes had a 25–9 record for the season and will play football at Bucknell University next year. Jacobs, who won the championship last year, was 32–6. Team captain Brian Brown had a 20–6 record but didn’t compete at DISC due to an injury. 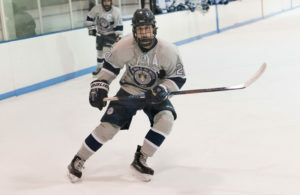 In an upset, The Hill School claimed its third championship in four seasons in the Mid-Atlantic Hockey League. Their record overall was 18-9-1. Christian Duvall, who had two goals and an assist in the final, plans to play a year of junior hockey before attending college. Several schools shared the spotlight this winter in Pennsylvania track. Julian Klenner of Westtown School ran the PAISAA 400-meter in 48.16 seconds, finishing first. The hurdles belonged to Malvern Prep’s Sebastian Costantini, winning in the 60-meters at the PAISAA championship meet. He’s committed as a kicker to Penn State for football. At the Tatnall School, Napoleon Hernandez ran the 400-meters in 50.25, the 500-meters in 1:06 and the 800-meters in 1:56. They were the best times in Delaware this year. Friends’ Central School’s girls track team had another good year. Junior Lydia Russell turned in a top performance in the 3000-meters at PAISAA, just beating a time of 10 minutes. In the 800-meter at the PAISAA championship, Micah Trusty, a freshman, ran the 800-meter in 2:10 to finish in second place. With their several championships, the leading athletes of the independent schools of County Lines country are enjoying continuing success in their chosen sports. The schools’ seniors are graduating and moving on to top college programs. And, from the looks of their underclassmen, the future promises that victories will continue.